In the year 1973 the department of post of government of India issued 34 stamps . 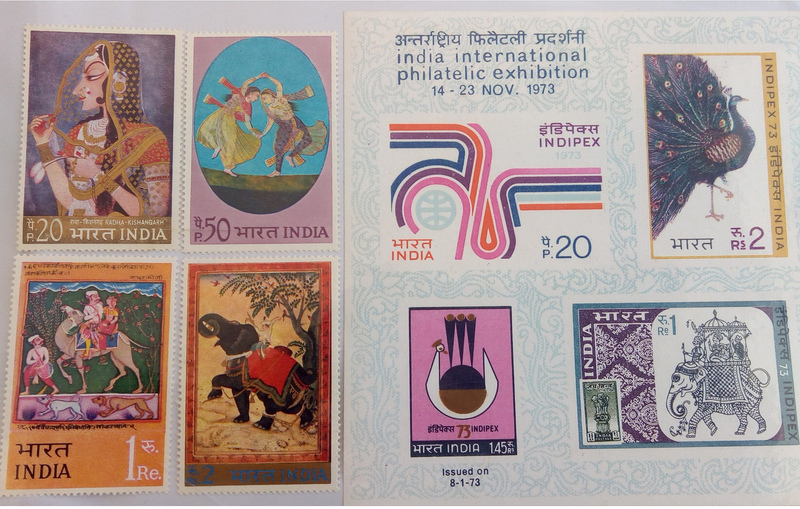 The first stamp was issued on Indipex Exhibition at New Delhi followed by stamp on 25 anniversary of India's independence . Other than this issues various stamps were issued on Jai Bangla ,KumaranAsan ,Homage to martyrs and Dr B r Ambedkar. A set of four stamps was issued on Indian Miniature Painting featuring radhakishangarh ,kathak dance duet , dhola and maru and elephant being tamed by prince jehangir's reign . A miniature sheet was issued on the occasion of indipex 73 on indipexemblem , ceremonial elephant and independence and peacock . The last issue of this year were on Ncc and on death anniversary of C Rajgopalchari .